Our joint conference provides a wonderful opportunity to meet colleagues in your field, connect with potential research partners, and develop greater cross-cultural, cross-discipline knowledge and awareness. Conference presenters and attendees come from a variety of fields and backgrounds, including academic faculty and students, Native/Indigenous community members, government personnel, museum staff, and individuals from private consulting and nonprofit agencies. This year’s conference will include multiple days of oral presentations, breakout sessions, active/applied demonstrations, and cultural field trips. 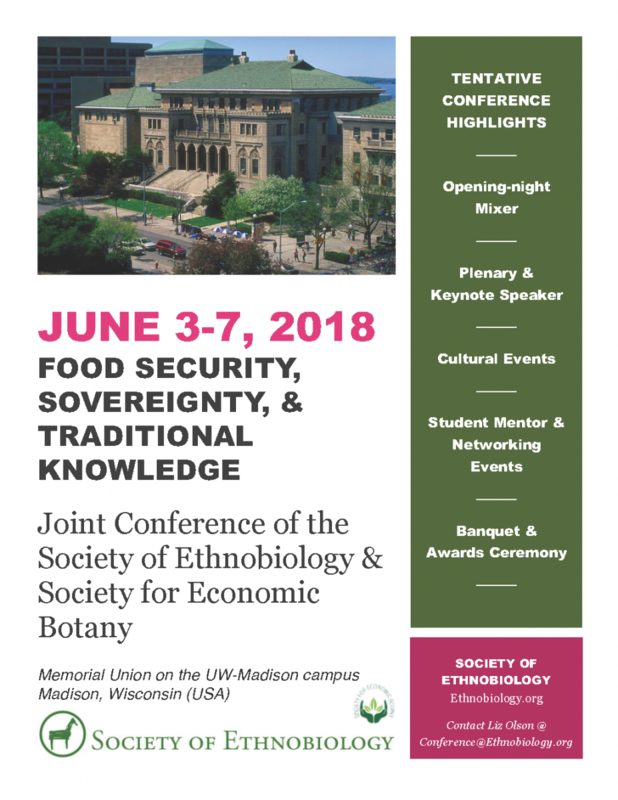 The conference will culminate in a joint banquet on Wednesday evening, and will include awards and talks from this year’s Distinguished Ethnobiologist and Distinguished Economic Botanist. Some funding support for this conference is provided by the National Science Foundation and The United States Department of Agriculture. We look forward to seeing you in Madison this June!